In this 1963 photo an energy flash, the product of a projectile hitting a solid surface at up to 17,000 mph, is shown. 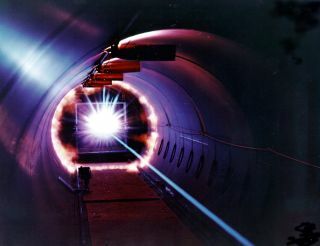 In this historical photo from the U.S. space agency, the "energy flash" produced when a projectile launched at speeds up to 17,000 mph impacts a solid surface is shown. The test was performed at the Hypervelocity Ballistic Range at NASA's Ames Research Center, Mountain View, California. This test is used to simulate what happens when a piece of orbital debris hits a spacecraft in orbit.